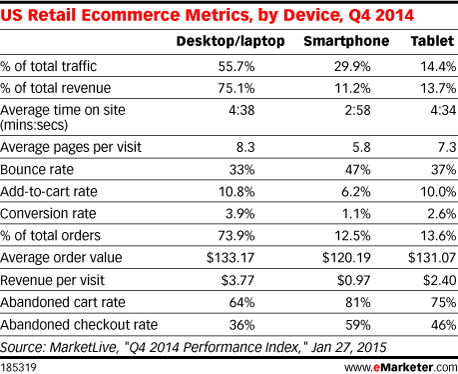 Data is from the January 2015 MarketLive "Q4 2014 Performance Index." MarketLive analyzed anonymous, aggregated US traffic and revenue data from MarketLive ecommerce websites that continuously reported data from October 1, 2013 or before through December 31, 2014, including desktop/laptop data. Data was sourced from Google Analytics. Orders and revenues are attributed to the last click the shopper makes toward purchasing an item based on standard Google Analytics tracking and reporting methodology.